An illustrated manuscript by a Spanish monk dating to the 1500s is the centerpiece of a small exhibition of works that reflect Europe's perceptions, often misguided, about the New World. 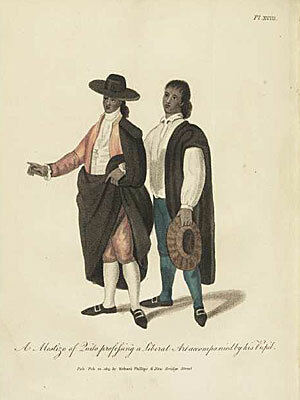 In "Sinchi Roca," left, one of the drawings by Martin de Murua on display in "The Marvel and Measure of Peru," the coat of arms and monarch's cape are European symbols of power. IN THE late 1500s a Spanish monk named Martín de Murúa sailed to Peru, where he spent years collecting materials about the history and culture of the Inca and their lives under colonial rule. By 1616 Murúa was back in Spain with an illustrated manuscript he called "General History of Peru" (Historia general del Piru). The monk couldn't find a publisher for his book and soon drifted off into obscurity. So did his manuscript. Fast-forward four centuries: The J. Paul Getty Museum buys a trove of illuminated manuscripts in 1983. For the rest of the decade nobody much notices Murúa's book, lost amid more than 400 other handwritten tomes. Then in 1990, two visiting scholars peek into the manuscript and discover a long-lost treasure: one of the earliest illustrated accounts of the Inca and their collision with European imperialism. Now Murúa's book is finally getting published and starring as the centerpiece of a show at the Getty called "The Marvel and Measure of Peru" (through Oct. 19). The small exhibit chronicles the way European perceptions of Peru changed from its first appearance on maps until the advent of photography, a period spanning 1550 to 1880. "It's about how artists created history with imagery and how that was taken back to the Old World," says curator Barbara Anderson, who borrowed images and textiles from various collections for the show. Francisco Pizarro and his conquistadors marched into Peru in 1524, amazed at the people, the plants, the landscape, the cities -- everything so different from Europe. "It is better to see it painted," wrote Gonzalo Fernández de Oviedo in 1555, " . . . than to try to make it understood with words, and much better still to see it than write or paint it." The first images of Peru published in Europe were made by artists who had never been there. The exhibit displays engravings of Peruvian cities that bear greater resemblances to Renaissance ideals of geometric grids than the actuality of Inca urban life. Costume books illustrated European notions of native dress. The inaccessibility of Inca culture is represented in the show by a quipu, a series of knotted strings that the Inca used to record historical dates -- a system that has still not been decoded. Other works marvel at the wonders of the New World. A stunning Dutch engraving of a sunflower plumbs the amazing details to be found in the flora of South America, while a color lithograph by a Peruvian scientist of two skulls, one still patched with hair and skin, illustrates the stark beauty that can be discovered in an ossuarium. A photograph by two French brothers who immigrated to Peru in the 19th century depicts a young Peruvian, his Indian features and rough clothes a dramatic contrast to the earlier images of Inca as finely dressed and devoid of any obvious ethnicity. The illustrations in Murúa's book were created by various artists, including possibly the monk himself. Others were made by a native Peruvian named Felipe Guaman Poma de Ayala, whose other work has long been appreciated by scholars. Yet even Murúa's book adulterated Peruvian culture. The Getty manuscript, which is being published in facsimile, is displayed in a glass case and opened to a colored pen and ink drawing of an Inca ruler called Sinchi Roca I. The monarch is shown accurately holding a a long ax-spear, wearing a feathered headdress and cloaked in a deep red tunic with a patterned skirt. Yet the artist has draped an iridescent silk cape over the ruler's shoulders and placed a coat of arms in the corner of the picture -- European symbols of power. Displayed next to the manuscript is an earlier version, dating from 1590, opened to a page showing two Inca entertainers singing and beating a drum -- a scene still familiar to anyone who's seen an Andean musical group performing in a public space. THE exhibit actually sprang from a research project comparing the two versions of Murúa's manuscript -- both of which have had journeys worthy of Odysseus. The earlier iteration was unknown until 1879 when it was found by a Spanish historian. Irish book collector John Galvin acquired the manuscript around 1950 and his son lent it to the Getty. The second version was the one Murúa tried to have published, with the author painstakingly collecting the religious and royal authorizations required in Spain. But Murúa could never find a patron to subsidize the book's publication and the manuscript was passed around until it reached the library of Charles IV, where it was looted by Napoleon's brother Joseph and recovered by the Duke of Wellington. The duke suggested to Sir Walter Scott that he make use of the manuscript for a historical novel, but the book continued to languish in anonymity for more than another century. Since scholars discovered the book's significance in the 1990s, the manuscript has become one of the most studied at the Getty. Besides the facsimile edition of the Getty Murúa, the museum is also publishing a collection of essays exploring the making of the two works. A symposium on the subject is scheduled for October. "This show is the culmination of a long research project," Anderson says. It's also an occasion to look at some beautiful and fascinating art.